How does fiber optic work? 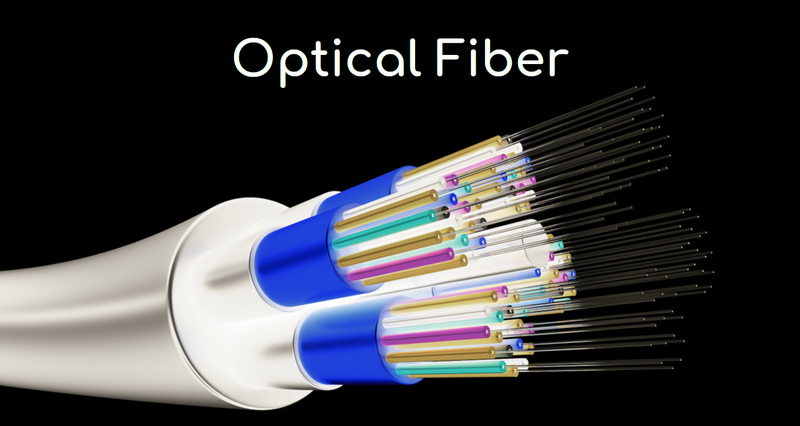 An optical fiber or optical fiber is a flexible, transparent fiber made by drawing glass (silica) or plastic to a diameter slightly thicker than that of a human hair. Optical fibers are used most often as a means to transmit light between the two ends of the fiber and find wide usage in fiber-optic communications, where they permit transmission over longer distances and at higher bandwidths (data rates) than electrical cables. They are arranged in bundles called optical cables and used to transmit light signals over long distances. Fibers are used instead of metal wires because signals travel along them with less loss and fibers are immune to electromagnetic interference. In the Core, it has thin glass center of the fiber where the light travels. The outer optical material surrounding the core that reflects the light back into the core and plastic coating that protects the fiber from damage and moisture. Hundreds of thousands of these optical fibers are arranged in bundles in optical cables. The bundles are protected by the cable's outer covering, called a jacket. These fibers have small cores about 3.5 x 10-4 inches or 9 microns in diameter and transmit infrared laser light; wavelength = 1,300 to 1,550 nanometers. In a single-mode fiber, all signals travel straight down the middle without bouncing off the edges (yellow line in the diagram). Cable TV, Internet, and telephone signals are generally carried by single-mode fibers, wrapped together into a huge bundle. Cables like this can send information over 100 km (60 miles). These fibers have larger cores about 2.5 x 10-3 inches or 62.5 microns in diameter and transmit infrared light wavelength = 850 to 1,300 nm from light-emitting diodes (LEDs). Each optical fiber in a multi-mode cable is about 10 times bigger than one in a single-mode cable. This means light beams can travel through the core with a variety of different paths. Multi-mode cables can send information only over relatively short distances and are used to link computer networks together. The glass fiber core and the cladding each have a different refractive index that bends incoming light at a certain angle. When light signals are sent through the fiber optic cable, they reflect off the core and cladding in a series of zig-zag bounces, adhering to a process called total internal reflection. The light signals do not travel at the speed of light because of the denser glass layers, instead of traveling about 30% slower than the speed of light. Signal throughout its journey, fiber optics transmission sometimes requires repeaters at distant intervals to regenerate the optical signal by converting it to an electrical signal, processing that electrical signal and retransmitting the optical signal. The optical fiber is used as a medium for telecommunication and computer networking because it is flexible and can be bundled as cables. It is especially advantageous for long-distance communications because light propagates through the fiber with little attenuation compared to electrical cables. This allows long distances to be spanned with few repeaters. Optical fiber cables are doing almost all the work every time you go online. With most high-speed broadband connections, only the last part of the information's journey (the so-called "last mile" from the fiber-connected cabinet on your street to your house or apartment) involves old-fashioned wires. It's fiber-optic cables, not copper wires, that now carry "likes" and "tweets" under our streets, through an increasing number of rural areas, and even deep beneath the oceans linking continents. The arrival of the broadband Internet made possible the phenomenon of cloud computing where people store and process their data remotely, using online services instead of a home or business PC in their own premises. optical fibers suffer less from interference, so offer better signal (picture and sound) quality; they need less amplification to boost signals so they travel over long distances, and they're altogether more cost-effective. Fiber broadband uses the Internet's standard way of carrying data ("packet switching") to serve TV programs and movies on demand. Fibers have many uses in remote sensing. In some applications, the sensor is itself an optical fiber. In other cases, fiber is used to connect a non-fiber optic sensor to a measurement system. The optical fiber can be used to transmit power using a photovoltaic cell to convert the light into electricity. It is especially useful in situations where it is desirable not to have a metallic conductor as in the case of use near MRI machines, which produce strong magnetic fields. Other examples are for powering electronics in high-powered antenna elements and measurement devices used in high-voltage transmission equipment. Medical gadgets that could help doctors peer inside our bodies without cutting them open were the first proper application of fiber optics over a half-century ago. Today, gastroscopes are just as important as ever, but fiber optics continues to spawn important new forms of medical scanning and diagnosis. One of the latest developments is called a lab on a fiber and involves inserting hair-thin fiber-optic cables, with built-in sensors, into a patient's body. These sorts of fibers are similar in scale to the ones in communication cables and thinner than the relatively chunky light guides used in gastroscopes. It's easy to picture Internet users linked together by giant webs of fiber-optic cables; it's much less obvious that the world's hi-tech military forces are connected the same way. Fiber-optic cables are inexpensive, thin, lightweight, high-capacity, robust against attack, and extremely secure, so they offer perfect ways to connect military bases and other installations, such as missile launch sites and radar tracking stations. Tanks, military airplanes, and helicopters have all been slowly switching from metal cables to fiber-optic ones.